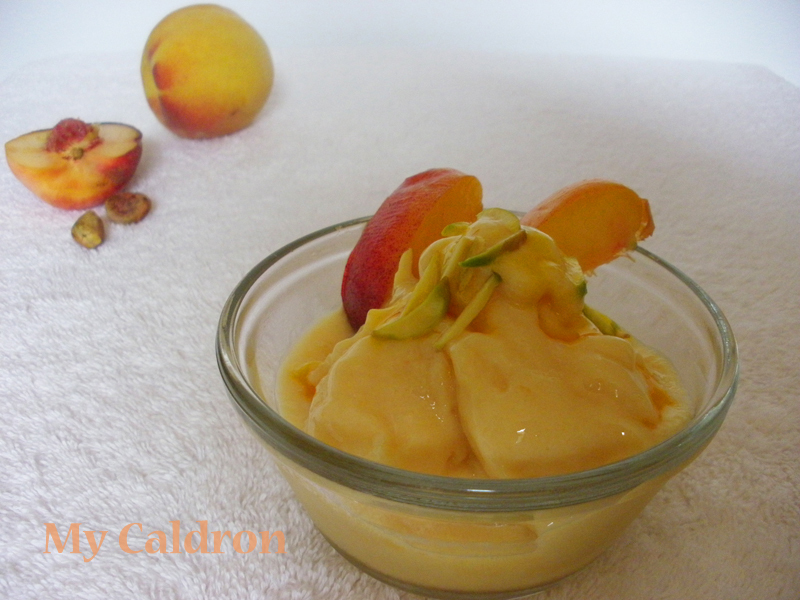 Before peach season is over, try this hearty and delicious dessert with fresh peach. I modified the original recipe a bit, and inspired by Iranian ice creams, also added dissolved saffron and silvered pistachio for topping. It turned tasty, pretty and fruity fresh! 2 cups peeled and diced peach, frozen half-solid. You could use store frozen peach as well. Pinch of teaspoon saffron powder dissolved in 1 teaspoon warm water, then cooled. Add the frozen peaches, maple syrup (or natural honey), yogurt and lemon juice to the bowl of a food processor. Process for five minutes or until creamy. Scoop the mixture into two bowls. Top each with few drops of saffron and some silvered pistachio. Serve immediately.